What Do You Mean By Foreign Labor Resource? Migration, which takes place within the same country, can also come under immigrant labor. This immigration mainly occurs in search of the job opportunities that are better in other places than the home country. These labors reside for the temporary period and usually deposit there salary back in their country. A skilled worker is a person with a specific skill, which is a result of training and knowledge. Obtaining a specific skill is a tough task. However, it is not necessary that a skill is learnt at a college institute or training sessions. Skill can be self-learnt also. Skilled Labors and workers have a great demand in the market. Skilled workers are of great use in the market for most jobs. Due to the retiring stage of the baby boomers, skilled labors have been a recurring issue for the employers all around the world. In addition, the demand for the skilled labors by the employers is another aspect that calls onto the foreign labor resource. The intensity of foreign labor resource has increased rapidly in the decade. More and more people migrate with the same motive. Countries like the United States, United Kingdom, United Arab Emirates, etc. see a fair share of migrants every year. Asian countries like India, Bangladesh, Nepal, Indonesia, Sri Lanka, Thailand, Philippines, Vietnam, etc. are not far behind in this case. These foreign labors come along with various advantages and disadvantages for the employer or for the country. The advantages may be to both the countries i.e. the country of the immigrant and the country where he works, are benefitted. There is a long list of advantages, which we will follow in this article. So let us have a keen look at the list of advantages of foreign labors first. If you want to survive in the international market, it is good to hire foreign employees (who knows the working conditions, local market and can speak local language) working for your oganization. But the complexities for getting an immigration especially in countries like US , UK etc is not so easy. If you are looking to immigrate to a country like USA, make sure you follow all the rules properly to avoid any kind immigration complexities. The immigration laws of united states are very strict and they always try to bring in the best and qualified employees in to their country. How do I hire a temporary foreign worker? Explain the worker what they would get from their application. Labour Market Impact Assessment (LMIA)is an assessment which checks whether there is a requirement for the job you are offering and is there any worker available to do it. The other option is to provide an employment offer, you can do this by paying the compliance fee using employer portal. By this, you get an employment number to offer. When you get the employment offer number, you need to give it to the worker so that he can apply for the work permit. Once the work permit approved the worker will receive an introduction letter. The original work permit will be provided when he arrives at the actual location. The following are the benefits that the employer as well as the host country gets on hiring a foreign talent as the company’s labor resource. Economically stronger countries have comparatively greater job opportunities. These opportunities attract the workers as if flowers lure the honeybees. Let me simplify through a simple example of the flowers. Flowers need pollination process through the bees to keep on growing and blooming. At the same time, the bees need the flowers’ nectar for making honey. Similarly, the bees are the foreign labors that are in need of job (income) aka honey. The flowers are the industries that require skilled bees to keep the market going. Well, let me get to the point. No job opportunities and ones’ country drives him or her to the other. The urgent need for income makes them start at any rate. As a result, the employer gets cheaper labor resource and it indirectly profits the country in developing its production or business in the international market. Baby boomer generation is gradually retiring. As a result, the previously handled position of the baby boomers stays vacant due to lack of experience in the present generation. This intensifies the demand of skilled labors in various fields. This demand has been getting higher with a huge rate in the decade. As a result, employers look forward to hiring skilled labors from various countries. People who are in search of jobs have a great invitation of opportunity here. These skilled labors are mostly trained within the country from where they migrated. On the other hand, they might know their skills well due to experience also. Due to the huge amount of people searching for job, the employers get abundance of choices to select the best from the lot. In addition, as the first point highlights, these employees are hired at a cheaper rate, which profits the employer in the overall turnover of the company. Thus, this is certainly one great profitable aspect for the employer of foreign workers. There is a huge requirement for the skilful labors. Cities or countries with abundance of job opportunities rarely have ‘unemployed skilled labors’. As a result, there are several opportunities for the job seekers. Moreover, they have great options laid in front of them, from which they can choose the better option. Well, this choosing thing makes it impossible for odd job vacancies to fill. Jobs at odd hours or the anti-social hours are among them too. Working in remote regions is another thing from which the people try to stay away. This is due to lack of modern technology and facilities in the area. Thus, these enterprises opt for foreign talents to make their way in these jobs such as hotel staff, construction, etc. Let me sum up with one example. You reside in your country and you have three jobs options. One is at a huge enterprise with a 9-5 job, while another one is in a remote area (which might need you to travel all the way there or shift from the city), and last is a night shift at a call center. What would you choose? Of course, option one. That is because it is more convenient to you. Thus, the other two enterprises might have to look for people who can work willingly. That is where the foreign workers bless them with work done at cheaper cost. The benefit of the country lies within the development of its enterprises and organizations. This is impossible without the interference of foreign workers. Foreign workers work in the various sectors of the companies in order to earn their living. This makes them willing enough to work for the companies’ benefit. That indirectly boosts the economy of the company and the country on a whole. Therefore, hiring of foreign labor is a boon in disguise for the country’s GDP i.e. the Gross Development Product. Employers who wish to expand their reach by expanding the company in other countries enjoy the benefits of contacts. They also come to know about the market and its demand. Therefore, employing the foreign workers can give an inside idea of the industry and its developing stage. Moreover, it gives the essential contacts in the other country to begin any industry. In addition, they also aid in overseas business ventures. Moreover, this also helps in cultural understanding and better representation oneself in another market. After all, it always proves to be beneficial to have an extra internal help. Training facilities are very important for the local worker. Skills are not always opted through colleges, and institutions. Work experience cannot always polish the skills of workers and thus they need a little guidance in the form of correct training. These training facilities can cost a lot to the employers. As a result, they hire skilled workers. However, when it is impossible to obtain large number of skilled labors, they hire a few and ask those to train the others. Foreign workers have diverse knowledge of things compared to the locals; as a result, employers get good talent at less expense. Discrimination is an age-old issue. Thus, it calls for adequate law and regulations against it. In the present year, several laws have been passed against discrimination. The industrial sector as well as the education sector has to abide by these rules. In such a condition, hiring foreign workers is the safest option. Their diverse culture and skills differentiate them from the rest. This undoubtedly saves the employer from any action (taken against the employer) regarding the discrimination law. What do you mean by remittance? Remittance refers to the act of sending money from one place to another (to the person at the other place). The people, who work in different countries i.e. away from the homeland and / or the family, perform the task of sending money. Many countries like USA, UK, UAE, etc. have innumerable labor guests in their country. These legal or illegal labor guests send their salary back home. Therefore, most of the origin countries collect major foreign currency through the act of remittance. Therefore, it also benefits the origin country in the task. This helps the origin country to boost the economic status. As a result, there is a significant development in the origin country. Therefore, we can conclude that there is innumerable benefit to the companies, employers, economies, countries and the people. However, it would be an insane decision to merely study the advantages of foreign labors and dig into investing on them. 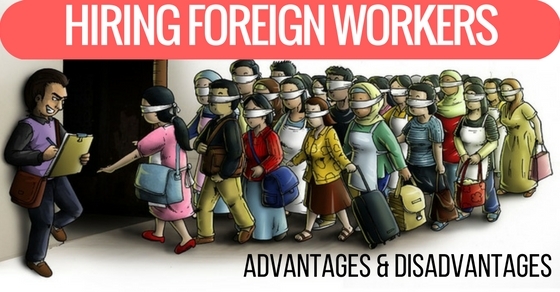 There are undeniable disadvantages of hiring the foreign workers too. Let us have a detail look on it too. Accepting someone from different culture or ethical motive can be difficult. Especially in the workplace, cultural diversity is a huge issue. For example, if your workplace includes local workers of the same culture, it becomes easier for them to understand each other. As a result, for them, working together is not much of a hassle. However, if you insert one person from different cultural and ethical background, present workers might put on their guards and not cooperate with the new addition. Therefore, the employers must invest in programs that include training for diverse environment. This can be the only solution to promote healthy work environment. Language barrier or the lack of lingua franca is a great barrier in the progress of any industry. In most countries, people are highly educated and well trained but they barely know English. English, being a common language, is used for trading as well as other works. Thus, if an employer decides to hire a foreign worker from another country then he or she must have to invest in ‘language’ i.e. English speaking courses for the candidate. As the language barrier may not only affect the comfort level of the candidate but also can create unnecessary trouble. The idea of hiring foreign talent seems so luring and profit-friendly to entrepreneurs (as well as the government) that the local talent faces huge difficulties in finding a proper job. As a result, more and more cases of unemployment occur. Fact: Most crimes are a result of long-term unemployment. Thus, unemployment is the root of crimes and employment is the way to eradicate it. Hiring foreign talent is a great idea as long as you are aware about the person’s ability and capability. Some people may fake their qualifications and you might not even be able to make out (the fakeness of it). As a result, employing a less qualified person will affect the business and in a longer run, it will affect the country’s economy. Instead of providing opportunities to the foreign labors, if you hire local talents they would have provided better results. Dedication and commitment are another set of issue that arises with the employment of foreign workers. There is a possibility that you hire a qualified person. As a result, you readily invest in the English classes and visa along with the settlement, etc. After a certain period if the person decides to quit, then your investment goes in vain. Moreover, foreign workers may need longer holidays as they travel all the way back to their country and get back. There are several more points that can be laid out to debate over the boon and bane of hiring foreign workers. However, it is a subjective decision that has various aspects. One needs to consider all the aspects cleverly and make a decision that fits well for your company.